Does Prison Decision Violate States' Rights? Tuesday’s decision by the U.S. Supreme Court, effectively putting the federal courts in charge of California prisons, directly involved the question of states’ rights. The decision, Brown vs. Plata, mandated that from 38,000 to 46,000 must be released because overcrowding violated the Eight Amendment’s ban on “cruel and unusual punishments.” The 5-4 decision’s majority opinion was written by Justice Anthony Kennedy, a Californian. It was the kind of federal meddling in state and local affairs that has become increasingly common since the Warren Court of the 1950s and 1960s. Federal courts now regularly oversee school busing plans, school finances, health issues, police actions — almost anything. Today the Court affirms what is perhaps the most radical injunction issued by a court in our Nation’s history: an order requiring California to release the staggering number of 46,000 convicted criminals. There comes before us, now and then, a case whose proper outcome is so clearly indicated by tradition and common sense, that its decision ought to shape the law, rather than vice versa. One would think that, before allowing the decree of a federal district court to release 46,000 convicted felons, this Court would bend every effort to read the law in such a way as to avoid that outrageous result. Today, quite to the contrary, the Court disregards stringently drawn provisions of the governing statute, and traditional constitutional limitations upon the power of a federal judge, in order to uphold the absurd. The proceedings that led to this result were a judicial travesty. I dissent because the institutional reform the District Court has undertaken violates the terms of the governing statute, ignores bedrock limitations on the power of Article III judges, and takes federal courts wildly beyond their institutional capacity. Scalia’s words are an excellent explanation of states’ rights and the limitation of the role of federal judges. However, earlier this month Scalia himself backed a ruling that violated the rights of states to manage their own affairs. It was a case that actually was a much more “radical injunction” than the California prison case. Police officers in Lexington, Kentucky, followed a suspected drug dealerto an apartment complex. They smelled marijuana outside anapartment door, knocked loudly, and announced their presence. As soon as the officers began knocking, they heard noises coming from the apartment; the officers believed that these noises were consistent with the destruction of evidence. The officers announced their intent to enter the apartment, kicked in the door, and found respondent andothers. They saw drugs in plain view during a protective sweep of the apartment and found additional evidence during a subsequent search. The Circuit Court denied respondent’s motion to suppress the evidence, holding that exigent circumstances — the need to prevent destruction of evidence — justified the warrantless entry. Respondent entered a conditional guilty plea, reserving his right to appeal the suppression ruling, and the Kentucky Court of Appeals affirmed. The Supreme Court of Kentucky reversed. The court assumed that exigent circumstances existed, but it nonetheless invalidated the search. The exigent circumstances rule did not apply, the court held, because the police should have foreseen that their conduct would prompt the occupants to attempt to destroy evidence. Thus, the state of Kentucky took charge of its own law enforcement, and its state Supreme Court interpreted the Fourth Amendment in a strong fashion. But then the U.S. Supreme Court intervened and reversed the state ruling, imposing its will on Kentucky. It said that the search was permissable, effectively eviscerating the Fourth Amendment. From now on, if police suspect you of drug use or dealing, they don’t need a warrant, as mandated by the Fourth Amendment. They can just wait outside your home until you flush the toilet, then say you are “destroying evidence” and barge inside. The majority opinion was written by Justice Samuel Alito, and was joined in the opinion by Scalia. So, Scalia defended states’ rights in the California prison case, but overturned states’ rights in the Kentucky case. There is a pattern here: support for law-enforcement authorities over the rights of the people. Scalia’s protestations concerning the California case, quoted above, ring hollow in light of his actions in the Kentucky case. The Court today arms the police with a way routinely to dishonor the Fourth Amendment’s warrant requirement in drug cases. In lieu of presenting their evidence to a neutral magistrate, police officers may now knock, listen, then break the door down, nevermind that they had ample time to obtain a warrant. In addition to his position backing federal meddling in the Kentucky search case (cited above), in 1990 in Employment Division vs. Smith, Scalia wrote the opinion in another case that violated states’ rights. The case involved American Indians who used peyote in their Native American religious rites. When this was found out, they were fired in their jobs as drug counselors at a private drug rehabilitation clinic. I would say that a private clinic had a right to regulate its own affairs. But the Oregon Supreme Court ruled that the firing violated the Indians’ First Amendment right to freedom of religion. To permit this would be to make the professed doctrines of religious belief superior to the law of the land, and in effect to permit every citizen to become a law unto himself. Actually, “to permit this” would have meant allowing the state of Oregon to interpret its own laws. SEC. 13. The right of the people to be secure in their persons, houses, papers, and effects against unreasonable seizures and searches may not be violated; and a warrant may not issue except on probable cause, supported by oath or affirmation, particularly describing the place to be searched and the persons and things to be seized. In criminal cases the rights of a defendant … to not suffer the imposition of cruel or unusual punishment, shall be construed by the courts of this State in a manner consistent with the Constitution of the United States. That section effectively cedes the final interpretation of the California Constitution, and all law in California, to the federal government — that is, to the U.S. Supreme Court. Perhaps that section is unwise. Federal meddling in many cases has done more harm than good. And other state constitutions have no such clause. California also could remove that clause from its Constitution. But that clause actually is in the California Constitution, something Scalia seems to have neglected. Although states’ rights is an essential part of the original compact of the American states, it has been almost completely eviscerated. Today, people on all sides of an issue commonly file lawsuits in federal court. As we have seen, even Justice Scalia, a conservative who claims to defend states’ rights, violates those rights when he deems it necessary. Conservatives have been trying for decades to try to reverse this federal usurpation of state powers. But when even a conservative “states rights” justice like Scalia frequently increases federal powers over the states, the effort must be judged mostly futile. 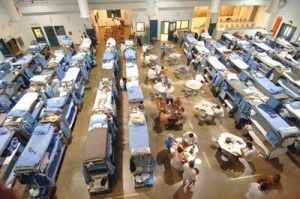 In the case of California’s prisons, which really are torture chambers, at least the overcrowding now must be dealt with. Having ceded so much control to the federal government, California and other state governments now are going have to live with it.